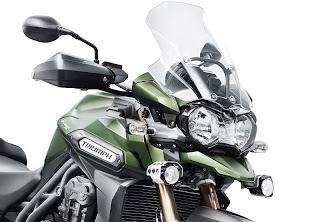 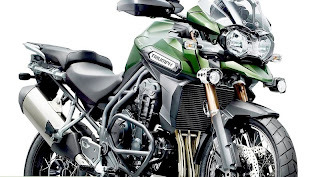 The XC model designation is the slightly higher spec’d version of the 2013 Triumph Tiger Explorer base model, it comes with the same 1215cc triple cylinder engine producing 113hp and 75 ft-lbs of torque. 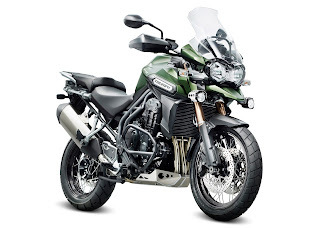 It’s fitted with steel-spoked wheels with aluminum rims that are designed to use tubeless tires, this significantly simplifies puncture repair which is almost a full time job in and of itself on some off-oad trips. That engine gets a tubular-steel framework on the Explorer XC, to prevent damage from drops, it also has an aluminium sump guard to stop large rocks from thumping into the bottom of the engine. The standard model 2013 Triumph Tiger Explorer already comes with traction control, switchable antilock brakes and cruise control, making it one of the better equipped bikes in this segment of the market.